The requirements by the cosmetics industry regulations for the right packaging and the fact that more consumers expect higher standards drives cosmetic packaging manufacturers to continuously develop innovative packaging solutions that reflect the consumers’ lifestyles and preferences. 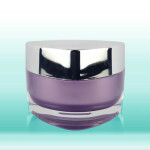 Cosmetic products such as lotions, foundations, toners and serums are packaged in airless cosmetic bottles. These bottles are generally crafted to provide better preservation of the product; with the airtight sealing, oxidation is minimized. Oxidation can cause cosmetic products to deteriorate faster and therefore packaging cosmetics in airless bottles means the quality of the product is preserved for longer and the shelf life is extended. 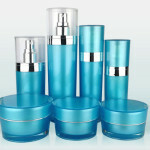 Avoiding oxidation and contamination has always been a challenge when it comes to packaging cosmetic products. Contact with air often affects the physical and chemical properties of the ingredients. Microbes can also play havoc with cosmetics, especially as the trend these days is to reduce the use of preservatives. Airless cosmetic bottles are the perfect solutions for packaging products which are sensitive to chemical or microbial attacks. 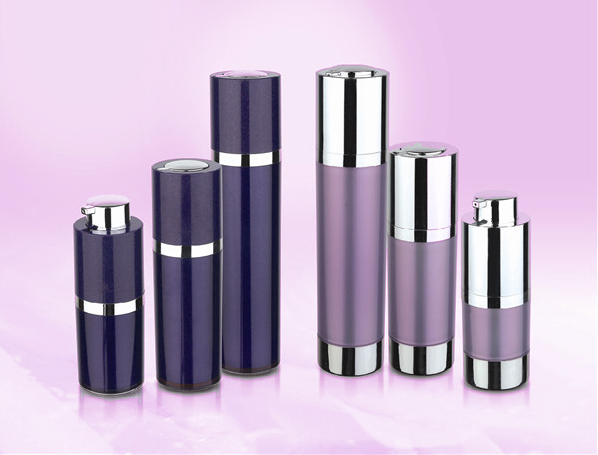 A notable feature with most airless cosmetic bottles is their stylish, attractive designs. Standard airless bottle comprise the body of the container and a pump sprayer at the top for dispensing the contents of the bottle. Generally, airless bottles are used to package high end cosmetic products and they tend to be more expensive than regular pump bottles. Production of airless cosmetic bottles allows plenty of room for customization because buyers can give specifications to the manufacturer to make bottles that suit the specific needs. For example, many manufacturers provide several options regarding color, shape and size or volume, material, number of bottles and style. 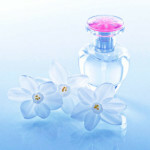 Because the bottles are sold in bulk, there is usually a minimum number of pieces that a buyer can order. The preferred color on the bottle can be achieved in several ways including spray painting, ultraviolet coating, metallization among others. Color finishes in gold, silver or aluminum are common and these give a sleek, classy finishing and these can be applied to parts or whole of the container. For purposes of branding and enhancing the design on the outer surface of the bottles, printing, hot stamping or silk screen printing is done according to client requirements. Another effect that is popular in the production of airless bottles is the matt-ice’ look. This type of finishing is achieved using a frosting technology in which the bottle’s surface is spray frosted to achieve an elegant matt finishing. With regards to material, the most important factors are compatibility, environmental considerations and durability. The most common materials used in making airless bottles are polypropylene (PP), acrylic, PETG and PETE plastic. These materials are highly resistant to chemical damage while offering excellent transparency, are compatible with the ingredients used in making cosmetics and are strong enough to last. Furthermore, these materials are environmentally friendly and the bottles can be recycled. 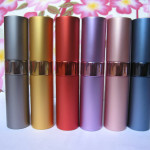 Besides the regular pump spray, some airless cosmetic bottles have lock and twist pump action. 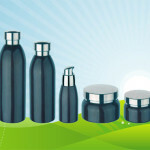 This, coupled with the use of superior quality materials in making the caps, makes the bottles highly leak proof and ideal for carrying around for people on the go. Testing to make sure that airless bottles dispense properly is important before the bottles are delivered to the client. A pump spray that works properly helps to avoid wastage as the user removes only the amount needed at a time. 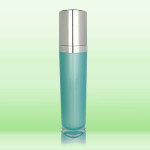 In fact, the pump action in airless bottles can evacuate up to 95 percent of the product. 1. Oxygen, sunlight and microbes, which cosmetic products are often exposed to during storage and use, can change their characteristics, result in strange odors, discoloration or contamination. This reduces the shelf life of the product and degrades its quality and effectiveness once opened. Airless packaging helps prevent contact of the product with air and contaminants during filling, storage and use, thus increasing longevity and preserving quality. 2. As the danger of contamination and degradation is almost non-existent for airless packaging, it allows manufacturers to reduce the use of preservatives thus keeping products more organic. This is a great advantage, especially in the case of natural products. 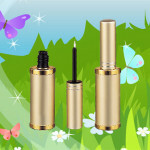 In fact, some cosmetics can only be packaged using airless cosmetic bottles. 3. Airless packaging avoids wastage as the consumer can use the product up to the last drop. The precision pumps and other mechanisms used by airless packaging allows smooth and accurate dispensation of the product during each use even for highly viscous products. Different types of airless cosmetic bottles and dispensing pumps are available, each specialized for particular types of applications. Environmentally friendly, zero CFC emission packaging is available in different sizes with an airless pump that can be activated by using the fingertips. Each use dispenses an accurate amount of the product. Once the product is dispensed the orifice closes to keep the air out. Another type of packaging uses a bottle that accurately shows the shades of the product and again provides an airtight, soft lip mechanism that prevents any excess flow of the product during and after usage. Packaging options that preserve the neutrality of the product by preventing even the metal or other parts of the dispensing mechanism from affecting the product are also available. This is useful for highly sensitive formulations. Another packaging option not only prevents contamination and ensures neutrality, but also has a mechanism that prevents any product that has come in contact with air while being dispensed from flowing back into the bottle. If the drying up of the product at the pump opening is a concern, there are dispensers that will prevent this from happening. Airless cosmetic bottles specially made for packaging and dispensing very viscous and sensitive products with a number of ingredients are also available. These are very suitable for products in the form of gels, balms, emulsions and lotions. Airless packaging technology is more expensive than basic packaging such as jars and tubes, however, as it is gaining popularity, the costs are going down. There are some cost advantages of using airless technology as the amount spent on ingredients such as preservatives and antioxidants to increase shelf life can be saved. The longer shelf life also allows for longer expiry periods. Airless packaging also allows for filling at faster speeds compared to traditional packaging. 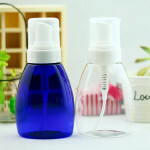 The advantages and applications of airless cosmetic bottles allow for the introduction of more organic products that are relatively free from preservatives. These products will also retain their quality and give a consistent user experience throughout the usage period. A switch to airless packaging by most cosmetic manufacturers can soon be expected.